Mermaids and mythical sea creatures capture our imagination, here I share a category of zen doodle drawings I call Hair Maids. They usually have a female head in profile and a snake like body, or just a head with long strands of hair cascading out. Imagine creatures based within the water element, not on the physical realm but in a different dimension. While Zen doodling, an activity I try to do every day, my pen took a new twist. I found myself drawing something like a mermaid but it was just a head with curls on. I just went with the process and drew several of them in the coming weeks. I came up with the name hair maids because they seemed having very long hair and no body. So I started to ponder this. Anything coming out on the paper in the drawing process (also called zen tangle) reflects processes in the subconscious mind. So what could this symbolic shape mean? What I had drawn above could be considered to be a “Naga.” Nagas are snake like beings, which are depicted in early Hindu and Chinese art as humans on the upper half, or just the head as in this image above. Buddhist iconography depicts Nagas as giant cobras or more like dragons without legs. And in some cases like mermaids: as human with a snake like fish tail. In Buddhist scripture and myths, Nagas are either very wise and beneficent or negative that can cause us many disturbances including illnesses related to water imbalance. Nagas are also considered as water deities, which are protecting rivers and lakes. Emotions are watery in essence, and are in fact flowing energy forms that we create inside ourselves based on the reactions we have to inner and outer events. A gift of a kindness may generate joy, but a criticism might make us feel angry. If one look at these energy forms from a healing point of view, they appear as moving fields, or strands emanating outward from the person having the emotions. If the emotions are suppressed and left unchecked they can become enmeshed as physical knots or emotional tensions which might cause insomnia, stress and fear. I love my zen doodling as it is a way to sort out my mind without thinking about it. When I focus on my drawing my mind relax and naturally other parts also relax and can be freed of unnecessary baggage. Why not try it yourself! 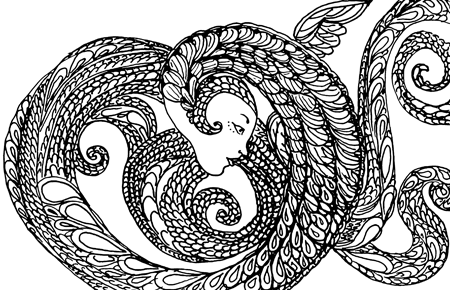 This entry was posted in Mermaids and tagged buddhist scripture, doodling art, emotional healing, meditational drawing, mythical sea creatures, stress remedy, zen doodle, zen tangle. Bookmark the permalink. Hi Margherita, I really liked your zen doodling article!